Maud Gatewood ‘54 was more than a painter. She was an artist in every aspect of her life. 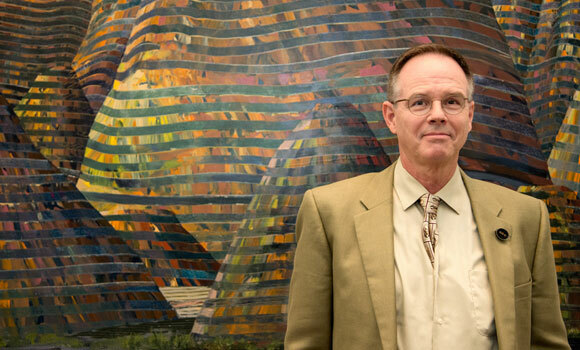 “Art is really a way to look at the world,” said Will South, former curator of the Weatherspoon Art Museum. South shared his memories of Gatewood and discussed her art Thursday evening to a standing room only crowd to mark the beginning of the Maud Gatewood Trail – a collaborative exhibit of Gatewood’s paintings in 18 different locations spanning from Wilmington to Asheville and as far north as Danville, Virginia. South became acquainted with Gatewood toward the end of her life, while he was working on a biography of Gregory Ivy, the founder of the Weatherspoon Museum. South interviewed Gatewood for the project, and the two developed a friendship. Gatewood’s talent isn’t just displayed in the form of her paintings, however. Her creativity lies in the meaning behind her paintings. “The idea is a document of a journey,” South said, adding that the journey is often dark and mysterious. “You would never confuse her with a painter like Thomas Kinkade,” he added. While Kinkade’s paintings are happy, picturesque pieces, Gatewood’s are “not designed to make everyone feel good,” South said. “That’s just where her most interesting work lands – almost the anti-Kinkade,” he said. UNCG’s exhibit will be on display until Nov. 8. Gatewood’s artwork is on display at the art department gallery in the Gatewood Building and the Weatherspoon Art Museum. Her sketches and letters are on display at Jackson Library’s special collections. There will be several more events at UNCG surrounding Maud Gatewood’s work in the coming weeks. On Oct. 1, William R. Ferris, eminent professor of history at UNC Chapel Hill, and Joel R. Williamson, senior associate director for the Center for the Study of the American South, will give a presentation titled “Maud Gatewood: Artistic Voice of the South” in Weatherspoon Auditorium at 5:30 p.m. The lecture will be followed by a reception and book signing in the Art Department Gallery of the Gatewood Studio Arts Department.